The Jaipur round of the dialogue held from 25 to 16 February deliberated on a number of important security related issues that the Indo-Pacific regions have to deal with. Evaluating and addressing common threats in cyber space that would destabilise not only security, but also the international finance system was one such subject that was taken up for discussion. Maritime Governance: Indian Ocean vs. the Pacific Ocean, China’s Role in the region, Enabling tools of Cooperation and Countering Terrorism & Extremism were the other subjects that were discussed during the two-day gathering. 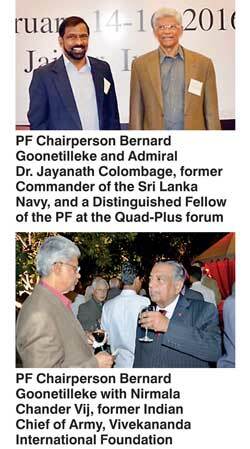 Admiral Dr. Jayanath Colombage, former Commander of the Sri Lanka Navy, and a Distinguished Fellow of the Pathfinder Foundation (PF) presented a paper on the subject of terrorism focusing on the lessons learned from the Sri Lanka’s experience in countering terrorism, which was received with enthusiasm. He emphasized the need for the international community to be united in tackling the menace of terrorism and highlighted the fact that countries should not adopt double standard in dealing with terrorism. Bernard Goonetilleke, Chairperson of PF, discussed China’s rise as a maritime power, its role as a permanent member of the United Nations Security Council and emerging global political and economic power and the need to involve that country in the dialogue relating to Indian Ocean security. He proposed that the major maritime users of the Indian Ocean and the states in the region should work to evolve a ‘Code of Conduct’ relating to their maritime operations in the Indian Ocean. Quad-Plus forum has arranged to publish its work for dissemination by the public. The deliberations of the first session held in Canberra has already been publish with title “The Quad Plus: Towards a Shared Strategic Vision for the Indo-Pacific’. The Jaipur round of discussion is will also be published in a similar manner, which would provide an opportunity for the public to study the multifaceted security related issues the world at large will have to grapple with in the 21st century.